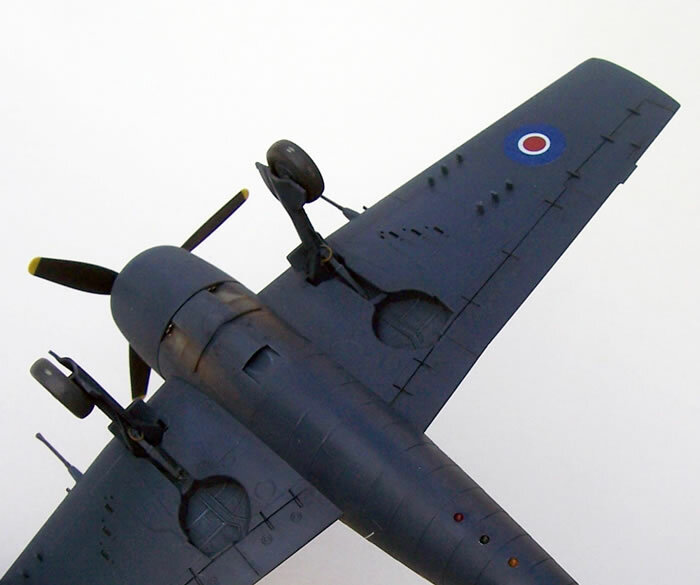 I had just completed a build of Cyber Hobby’s new Sea Vixen FAW 1 for a Fleet Air Arm (FAA) group build with my modelling mates, and was pondering what to do to next. I knew that I did not feel like revisiting any of my numerous started but stalled projects; so in the end, I decided that I should build something that would present few assembly problems and be simple to paint. 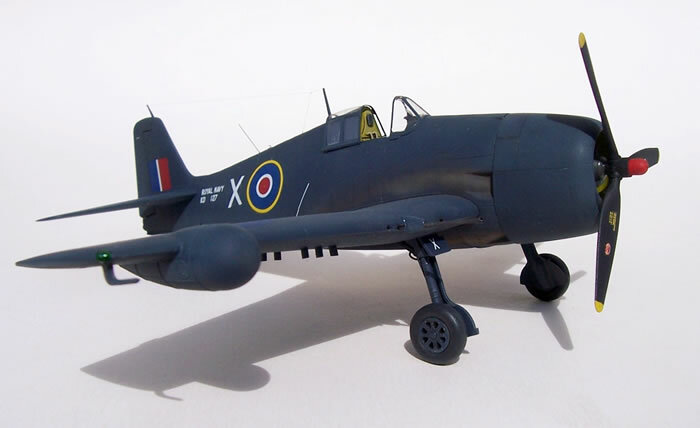 I have reviewed a couple Eduard’s 1/72-scale F6F Hellcat kits for HyperScale, and had four un-built examples to tempt me. They looked to be good quality kits yet simple to build, and several featured simple single colour schemes. Just what the doctor ordered! I still had the FAA bug, and my Eduard Hellcats offered a number of overall blue FAA options. I settled on an F6F-5N Profipac Edition, as it had a FAA option with European theatre roundels on an overall blue scheme. I tend to associate overall blue FAA Hellcats with the Pacific and CBI theatres wearing blue and white roundels, or blue and white roundels and bars, so this made for an interesting variation. It also had 20-mm cannon and no drop-tank, which would serve to add extra interest. My first look review of this kit is here on HyperScale. The only Eduard kit I have built previously was their La-7, which was a good but also slightly bland experience; probably due to it being a simple kit with a simple colour scheme. Eduard has moved quite a long way in a short time since releasing their La-7, so I expected more from their Hellcat kit. The kit is easy to assemble with good fitting parts; although not quite Tamiya-sharp, it equals the best of the other leading brands. I found Eduard’s plastic to be a little softer than say Hasegawa’s or Academy’s, but it was still fine to work with. I used a little filler on the insert for the underside hot air outlet duct, and around the cowling rim. Mr Surfacer took care of any other minor blending jobs, such as the wing radome. The wings to fuselage joins are superb, as are the tail-plane joins, although these take a little more effort to align correctly. I left out the gun inserts as I made my .50-cal barrels from a hypodermic needle. The Profipac Edition offers a lot of cockpit detail for the scale. I used the kit’s coloured PE instrument panel in preference to the plastic and decal option. I painted the cockpit per the instructions, but I think that the Mr Colour Cockpit Green they specify looks rather yellow. The cockpit detail went together well, but I had to replace the PE throttle quadrant with sprue as I lost it to the carpet monster. I also chose to use a Quickboost resin and PE gun-sight in place of the kit item. Eduard provides open and closed canopy parts with pre-cut masks. The transparencies are beautifully clear and are a good fit. 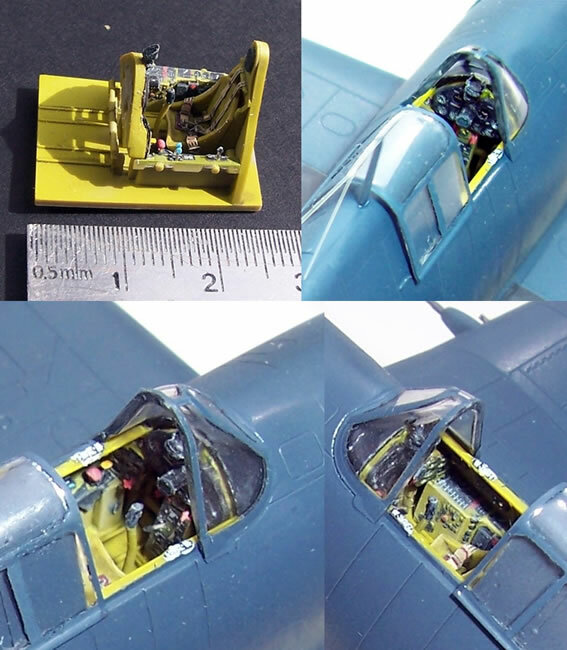 However, I chose to use a Falcon Vac-form canopy for the Hasegawa F6F kit to replace just the sliding hood, as I felt that the kit part is a little thick to display open. I found the pre-cut masks to be a good fit for Falcon’s canopy, which was a nice and convenient bonus. The engine is very nicely done with some fine cooling fin detail on the cylinders and their heads. The reduction gear housing, magnetos and prop governor are quite adequate, although the latter has small sink marks on either side. I was pleasantly surprised with how easy the PE ignition harness was to fit, and how effective it looked despite being flat in section. There are a couple of coloured PE placards that affix to the reduction gear housing, and a nicely done prop to round out the engine side of things. Eduard give a choice of tyre patterns for the main wheels, and the tyres are separate from the wheel hubs. This makes painting them a breeze, and is something that I wish more manufacturers would do. The main undercarriage is easy to assemble and locate in the wheel wells. I added brake lines and a couple of hydraulic hoses to the main undercarriage legs using lead and brass wire. The tail wheel however is a bit of a disappointment (something I overlooked in my first look review). This one-piece affair lacks a gap between the leg and the door, and the door extends down too far and is not quite the right shape. I decided to refine and reshape this area; but I went too far when I chose to drill out the lightening holes in the tail-wheel leg and replace the kit’s solid tyre with a pneumatic one from my spares box. Long story short, I wrecked the Eduard tail-wheel and had to rob an Academy Hellcat of its better but still imperfect one. 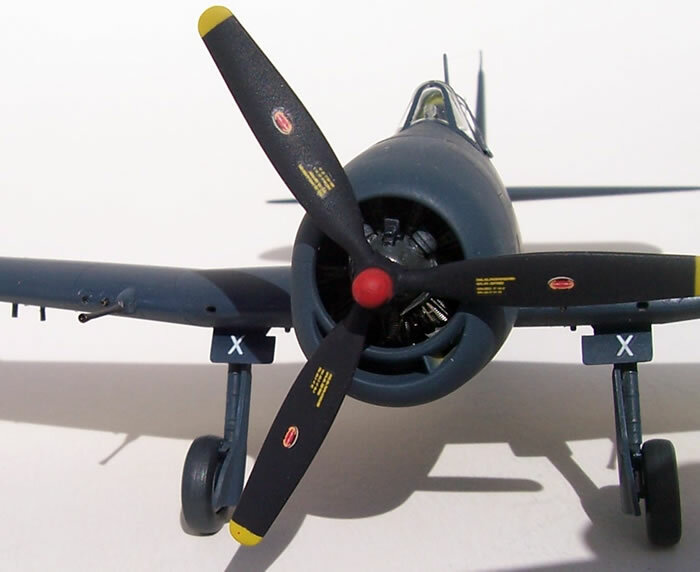 The kit does not provide separate rocket stubs should you wish to model an F6F-5 without rockets. This was another oversight from my first look review, and I feel by Eduard as well. 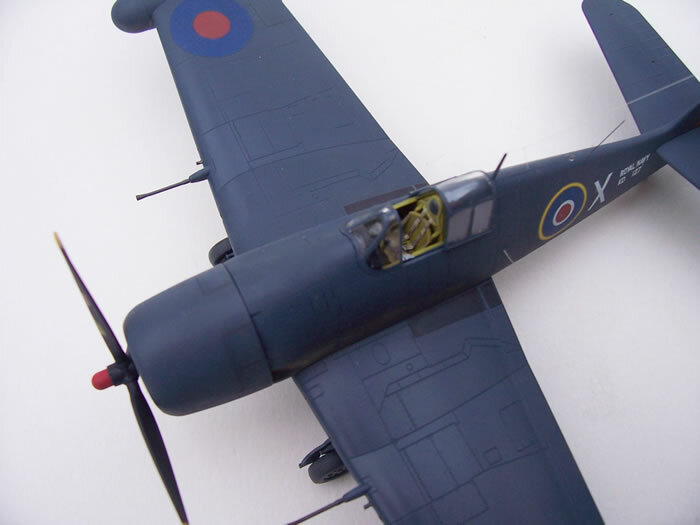 I was building a nightfighter version based in the UK without rockets, so I had to fill the dozen holes in the wings and scratch-build the zero-length mounts. I removed the two ID lights on the fuselage spine; the forward one is not needed for the F6F-5 anyway, and I replaced the rear one with a clear resin item. The only other modifications I made to the kit were to drill out the exhaust stubs and the cannon flash hiders. The F6F plans in my copy of Detail & Scale F6F show that the fuselage antenna should be slightly offset to port. Eduard has a hole for the antenna just off the centreline on the port fuselage half, but this was too small to receive the antenna. I assumed that a matching hole was missing from the starboard fuselage half, and so I enlarged the existing hole towards the centreline to make it big enough to take the antenna mast. I only realised that the antenna mast should be offset after painting my model, so mine is on the centreline as a result. 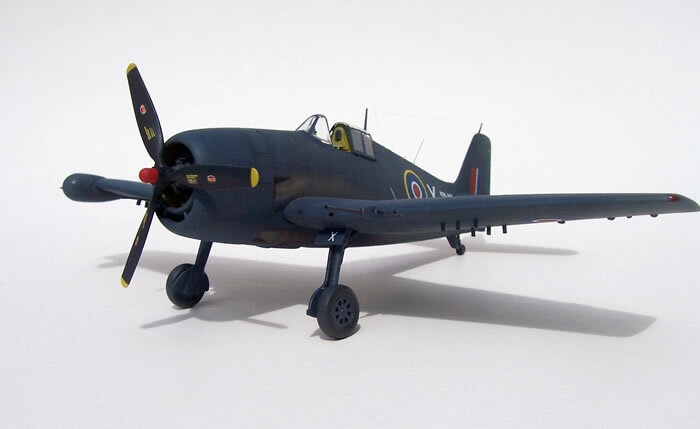 Painting was very simple indeed, as I masked the canopy using the kit’s pre-cut masks and the whole airframe was all one colour; this being FS 15052 Navy Blue. I had this colour in acrylic and enamel options, but not in my selection of Mr Color lacquers, which would have been my first choice (the more I use this paint range the more I like it). I used Gunze acrylic H54 in preference to the enamel alternatives I had, as it could be ready for an oil wash. For other weathering I used dry-brushed oil paints and powdered chalk pastels. The decals were very good and settled down well; in fact, they are amongst the best I have used. I had a good gloss finish and did not need any setting or solvent solutions. However, the decals for the underside ID lights and prop logos were very slightly off-register. I finished off with household satin polyurethane varnish. One thing I did notice whilst decaling was that the paint and markings guide shows a lot of white stencilling, although very little of this is provided with the kit. 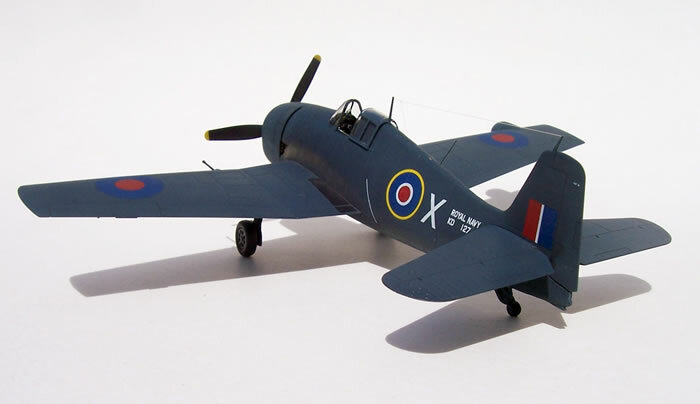 It occurred to me that perhaps the colour guides are shared with Eduard’s 1/48-scale F6F kits, and that these may offer more stencil decals. The other thing I found with the markings guide is that more panel lines are illustrated than are found on the kit’s wings. In addition, some panel lines are drawn in different places to those found on the kit. The significance of this is not to align decals on the model in accordance with the panel lines on the drawing, as it leads to problems. When doing so I found my roundels were in the wrong place on the wings and the fuselage code and serial number were too cramped. I ended up placing the decals where I judged to be best irrespective of panel lines. This build went very much as expected. Assembly was easy and the fit was very good for the most part, and at no stage was it poor. However, I feel that Eduard could have done a better job of the tail wheel, and included separate zero-length rocket stubs. The decals are very good to use, but I think that the paint and markings guide could be in better agreement with the kit’s panel lines and the stencilling provided. However, the kit's separate tyres, pre-cut paint masks, and very nice detail more than counter these minor quibbles; this was a most enjoyable build.